"I had to write to tell you how grateful I am. It is very, very difficult for me to find all natural, vegan moisturizers that I'm not allergic to ... 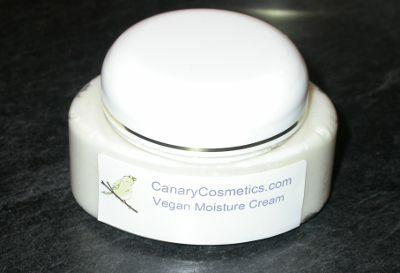 But your new Canary Vegan Moisturizer is fantastic! I can use it despite my many allergies, which is no small feat, and it is lovely stuff! It's a great base for mixing make-up with your mineral powders and it's a great moisturizer on it's own. Thank you so much!" "I cannot tell you how much this product soothes my skin. This is absolutely the first moisturizer I have used that didn't sting my face. I recently had a patch test and discovered I was allergic to many chemicals in my makeup. I found your name on Skin Deep, a part of the Environmental Working Group. Thanks for your fine products."